For the month of October 2017, Asia Law Network is collaborating with 99.co to bring great property-related legal content to readers of their blog written by Asia Law Network Premium Lawyers. In the first article of the series, Kelvin from Vicki Heng talks about renovation disputes and share tips on how to avoid and deal with them when they do come up. Owning and living in your own home is probably one of the biggest fantasies for any person. Whether you indulge it by haunting the corridors of IKEA or building your house from scratch in the virtual world of ‘The Sims’, you’ve probably spent a long time thinking about how it might look! With all these hopes and expectations, it’s not surprising that many homeowners look for contractors who are capable of not only understanding their creative visions but also delivering high-quality workmanship and materials in all the renovation works. Yet, in the homeowners’ rush to quickly engage the services of their preferred contractor, they may forget to take the appropriate measures to properly protect themselves. Soon, when shoddy workmanship and defects start appearing, renovation disputes between homeowners and contractors can threaten to turn your dream home into a nightmare. Renovations on a new home can cost anywhere up to 20 percent of the cost of buying your home – so being embroiled in a dispute like this will not only dramatically increase your financial outlay, but also delay the completion of your home AND lead to a lot of frustration and disappointment. In fact, according to the Straits Times, the Consumers Association of Singapore (CASE) received 1,447 complaints against renovation contractors in 2015, with the home renovation industry coming in fourth in terms of the number of complaints against it. Among the cases filed with CASE, only slightly over half were resolved in 2015, compared to 78 percent in 2014. Save your sanity (and wallet) from renovation disputes. Find a good contractor! To minimise the possibility of being involved in renovation disputes, you should first consider an accredited contractor which is recognised by both CASE, and the Singapore Renovation Contractors and Material Suppliers Association (RCMA). Such contractors are classified under the CASETRUST-RCMA Joint Accreditation scheme. If you are living in an HDB flat, make sure that the contractor is also registered with the Housing and Development Board (HDB). If the contractor is not registered with HDB, no renovation works may be carried out by the contractor at all. Once you’ve chosen a company from the CASETRUST-RCMA list, make sure you sign a contract with the contractor before starting renovation works. This contract should clearly outline and specify the exact terms of the agreement between you (the homeowner), and the contractor. How did you find out about the contractor? If you were recommended this contractor from friends, what feedback did they give on the contractor? How long has the contractor been in operation? 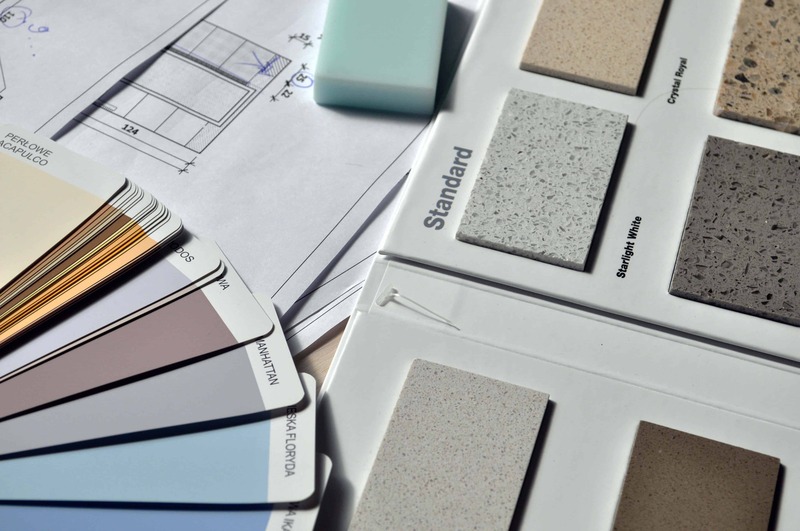 Know the difference between a contractor, and an Interior Design (ID) company. A contractor will usually just be the one engaged to perform the work. An ID company would be one that you engage to perform interior design and together with that, they will usually then offer to provide the renovation services as part of their ID package. However, it is not always the case that the ID company has its own in-house contractors and the work may actually be sub-contracted to other parties. These are things that prospective home-owners should be aware of. Separately, even contractors will usually sub-contract specialist works like plumbing and electrical works, to other sub-contractors. As such, prospective homeowners should ascertain the scope of the works that will be done by the contractors or the ID company’s own staff, and those that would be sub-contracted. Whilst sub-contracting is not necessarily a bad thing, as it means that the work is usually done by a more specialised contractor, it can also mean that the contractor might not have as much control over the timing and scheduling of the other specialist contractors and that is something that one ought to take into account. Here are a few tips to properly cover your bases that may save you a lot of headaches in the long run. 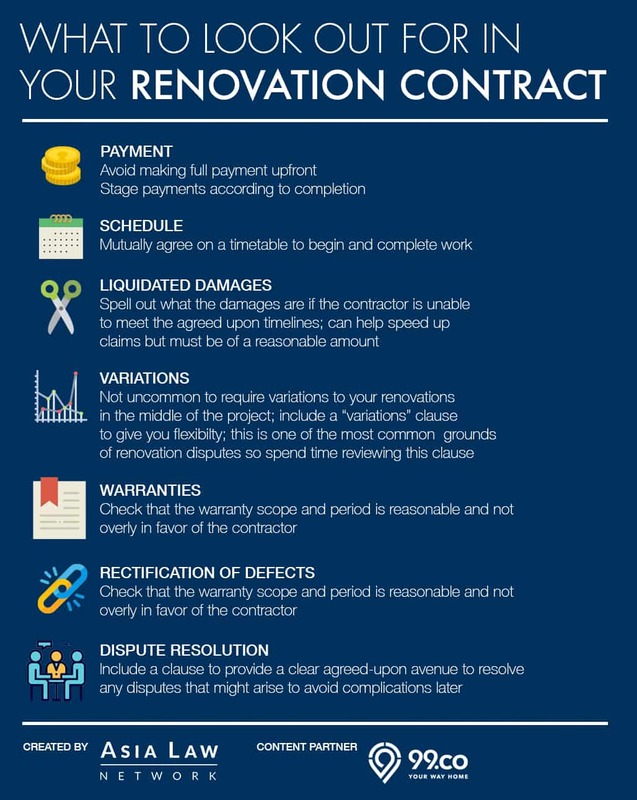 But just in case the previous paragraphs are a bit too much for you to read through quickly, you can refer to the table below for some important details that you should look out for in your renovation contract! I’ve Signed a Renovation Contract. What Next? With the contract signed, renovation works may now proceed. If you have the time, you should closely supervise the works, and inform the contractor immediately if you have any concerns. If there are any defects, document and record it immediately for reference, so the contractor can rectify it later. Moreover, only pay the contractor the amount agreed upon when you are satisfied that the work at each stage has been done properly and on time. But if you’re unhappy with your current contractor, and you’d like to engage another person to take over the renovation works, it’s only fair that you inform your current contractor, and mutually agree on the terms for termination and payment. Once you hire your new contractor, do make sure that the person is fully briefed on all your needs. Where necessary, you may need to apply for a new HDB renovation permit, and change your house keys too. What Should I Do if I’m in a Renovation Dispute? Renovation disputes with your contractor can be an emotionally difficult situation for a homeowner – especially since there are many layers of emotions, failed expectations, and frustrations involved in the renovation project. While it’s understandable for you to react negatively to such disputes, it is still possible to manage the situation constructively. If your contractor refuses to uphold their end of the renovation contract, Singapore’s legal system also makes it possible for you to escalate your efforts to recover any money incurred from damages. From our experience, the most common complaints or disputes relating to renovation contracts would be those relating to variations and substandard or defective works. First, you should re-read your contract to check if the contractor has broken any of the terms and conditions listed. If the contractor has broken his contractual obligations to you, take this time to communicate your complaint to him with reference to the contract’s terms. But, to be fair to the contractor, do offer him the opportunity to rectify the problem, or allow him to propose an acceptable compromise. If the complaint involves defective materials supplied by a subcontractor, then the main contractor that you hired will have to take responsibility for the actions of the subcontractor. However, if the problem originated from third-party suppliers that were hired by you, then the contractor is not liable for any problems resulting from this arrangement. If the contractor refuses to take responsibility for breaking the terms of the agreement between you and the contractor’s company, then you may lodge a complaint with CASE. The organisation will then correspond with the contractor on your behalf, or write a formal letter to the contractor regarding your complaint. Mediation by CASE is a relatively affordable option for homeowners to resolve such renovation disputes with a business, especially when compared to an expensive and lengthy civil lawsuit! If the mediation session is able to resolve the problem, then the contractor and you may be able to sign a binding agreement that settles the complaint. If the contractor then breaks the terms of this agreement, you would have a good reason that can be used to launch a lawsuit against him. If your “cause of action” was one year ago or earlier, and if you’re claiming for a sum of up to S$10,000, then you may file a claim with the Small Claims Tribunal. A “cause of action” in this context can refer to a number of things. For example, it can refer to the date when the renovation contract was broken. Or it can also refer to the date when the renovation works were due to be completed but was instead delayed or completed in an unsatisfactory manner. You are entitled to claim for an amount up to S$20,000 if your contractor agrees to a hearing at the Small Claims Tribunal. Generally, to determine how much to claim for, you may want to check with another contractor to determine the cost of correcting the defect. If your claim exceeds these designated limits, you would be advised to either lower your amount you are planning to claim, or you can commence a civil lawsuit against the contractor. However, if you do lower your claim amount, then you cannot seek a claim for the remaining sum afterward. If your “cause of action” was one year ago or earlier, and if you’re claiming for a sum of up to S$10,000, then you may file a claim with the Small Claims Tribunal. Depending on the terms listed in the original renovation contract with your contractor, you may be contractually required to pursue mandatory mediation or arbitration first in order to resolve the renovation dispute. But if all other options for dispute resolution have been exhausted, and if the amount you are seeking to claim exceeds the maximum allowed under the Small Claims Tribunal, then you may wish to consult a lawyer to obtain legal advice. Depending on the circumstances, the lawyer may advise you on whether launching a lawsuit may be appropriate for your needs. You should certainly start off with direct communication and discussion with the contractor to resolve the issue amicably out of court. Generally, from our experience, people do not have high hopes with lodging a complaint with CASE as the organisation does not have the power to make any binding orders when a complaint is made, and can only mediate or adjudicate. However, as the costs for them to do so are relatively minimal, there is no harm for parties to explore this. The Small Claims Tribunal is a more viable option for parties to consider, but bear in mind that the jurisdictional limit is only S$10,000, and this may preclude many renovation claims from being adjudicated. The reason for this limit is because the Small Claims Tribunal only takes into account the value of the underlying contract and not just the amount that is the subject of a claim. Lawyers are not allowed to attend cases at the Small Claims Tribunal, but from our experience, what happens is that an initial hearing is usually fixed around 4-6 weeks from the date when the case is first lodged at the tribunal. This first hearing is a mediation hearing, where the tribunal will try and get both parties to settle their claim amicably. Only if that does not succeed will a second hearing be fixed – usually within 4 weeks of the first hearing. It is at this second hearing that the tribunal will hear all the evidence, arguments and render its decision. Stuck In Renovation Disputes? There’s Still Hope! For many first-time homeowners, buying and renovating your own house can be an exhilarating and memorable experience. But if you’re not careful, the whole experience can quickly turn sour if you’re unlucky enough to encounter a less-than-ideal contractor. Still, if you’re currently embroiled in the middle of a renovation dispute, there are still avenues of help available to you! Aside from approaching CASE for assistance and mediation, the Small Claims Tribunal can also help you to recover the amount of money spent on rectifying defects. But if your claim amount exceeds the limits of the Small Claims Tribunal, it may be better to seek legal advice first before approaching the Courts to launch a lawsuit against the contractor! If you have a legal question about your options in renovation disputes, you can request a quote with Kelvin Tan from Vicki Heng Law Corporation. You can also get a quick consult with one of our practicing lawyers. With Quick Consult, you can check out in minutes and for a transparent, flat fee of S$49, the lawyers will call you back on the phone within 1-2 days to answer your questions and give you legal advice. This article is written by Kelvin Tan from Vicki Heng Law Corporation and Tang Chee Seng from Asia Law Network. Kelvin has worked in the construction and commercial litigation departments of Wong Partnership Elias Partnership under the guidance of various Senior Counsel. 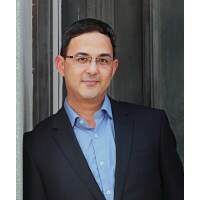 During those times he handled various complex commercial and constructed related disputes, including being on the team acting for the insurers in the Nicoll Highway Public Inquiry which spanned 6 months and for which the claim exceeded 500 million dollars. He had also worked in London for two years for Berrymans Lace Mawer where he handled professional negligence and liability claims. This included a GBP60 million dispute over the construction of the M6 highway. In the course of his practice, Kelvin has also built up a broad based corporate advisory practice. This started when he was seconded to Singapore Airlines as a general counsel. Since then he has acted and advised various companies in relation to corporate matters and presently advises a broad range of companies in various industries including media, food and beverage, IT and childcare.